Last weeks dinners consisted of lots of pizza and pasta. The weather was so beautiful, I took the opportunity to rake my yard. I was in no mood to make dinner rather I came inside and took a long hot bath to soothe my screaming muscles and blisters. Needless to say, my body was not happy with me. I threw it into gardening mode with no warning what so ever. But, damn it felt good to be outside soaking up the warm sun on my arms and working up a bit of a sweat. It does a body good! This week we are back to the chilly weather and I'm okay with that as I have been out of the kitchen for a whole week and itching to get back in there. I'm a girl who likes to have a menu planned for the week. I hate being caught off guard with my family lingering around looking at me with hungry eyes. There are moments I fear for my life. I would also much rather cook up some good food then make a run up to McDonalds and get home and bite into a cold cheeseburger or worse yet, cold fries. So, I am an organized cook. I function well that way and my family likes that stability too. This weekend I didn't plan a menu though. However, as luck would have it, I received my March Everday Food issue in the mail. In there, they have a whole weeks menu planned with a pre-printed shopping list. Bingo! I grabbed that and ran to my local Walmart. They had everything I needed except for the fresh Cilantro which is okay as my husband swears it's the devils weed! I like it and I put up with his black olives so every now and then he can put up with my cilantro. It's a give and take relationship we have over here. Enough chitter chatter, here is my pre-planned menu for the week. I'm a little nervous as there are some dishes that I'm a little hesitant about. 2 tablespoons finely chopped cilantro leaves, plush whole leaves for serving. Preheat oven to 400. In a small bowl, stir together cumin, coriander, and cayenne. If using. In a medium pot, bring potatoes to a boil in salted water over high and cook until tender when pierced with a knife, 10 minutes. With a slotted spoon, transfer potatoes to a paper-towel-lined plate and set aside. Return water to a boil, then add peas and cook just until tender. 3 minutes. Drain peas and set aside. Meanwhile, in a large ovenproof skillet, heat oil over medium-high. Season chicken with salt and cook, skin side down, until golden brown and crisp, about 5 minutes. Flip and transfer skillet to oven; roast until chicken is cooked through, 15 to 20 minutes. Remove chicken from skillet and pour off all but 1 tablespoon fat. Add potatoes and 1 1/2 teaspoons spice mix, reserving remaining for Thursday and cook over medium-high, stirring occasionally, until potatoes are golden in spots, 7 minutes. Stir in peas, lemon juice, and chopped cilantro; season to taste with salt and pepper. 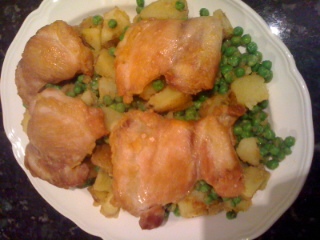 To serve, place chicken on top of peas and potatoes and sprinkle with cilantro leaves. Just a few notes I made for this recipe. When I drained some of the fat from the skillet, I found that I needed to add butter. I just couldn't help myself! Also, please DO NOT grab the handle of the skillet to give the potatoes a shake like I did. It hurts really bad and words you did not know were in your vocabulary will certainly make an appearance! Now, if you will excuse me, I am going to go put my hand on something cold!